Wow, it was a late one yesterday! Stuart and I went to London yesterday, and not ALL went to plan. We had planned to do our own thing in the daytime - he'd go to the Science Museum and see a Hidden Universe IMAX film and all the "cool" sciencey things while I hopped next door to see the Wildlife Photographer of the Year exhibition at the Natural History Museum. So we parted ways, I ended up standing in a queue to get in in the rain for a good half hour, finally got in just in time for my ticket time, got a bit lost but eventually found the exhib and entered. I'd see about 5 or 6 of the 100 photos on show and then a announcement came over the speakers "Attention, attention please. This is an emergency evacuation, please exit through the nearest fire escape." Oh great! I happened to be standing next to the escape so we all filed out, just in time for it to begin raining AGAIN! I was cold, wet, hungry (Stuart had my lunch in his bag!! ), alone and totally confused about what was going on. Stood around waiting for half an hour and finally gave up when it started POURING with rain and headed for the Science Museum....I went back mid afternoon but they were sold out so couldn't readmit me and weren't very helpful with trying to give me a refund - apparently it has to be requested online because I bought the ticket on their website(!?!?!). For dinner I'd been dying to try out a place called Wahaca which does Mexican food - I've heard its good and its run by one of my favourite Master Chef winners! Could we find the place!?! Nope! We has to settle for Pizza Express instead....oh well. In the evening we went to see Cirque du Soleil at the Royal Albert Hall. It was AMAZING!! Apart from a 45 minute break in the show half way through the second half due to a technical problem. They such a good job at picking up where they'd left off and everything, plus, some of the tricks they were doing suspended from ropes etc...I don't blame them for stopping due to lighting issues! I'd totally go see them again! Hopefully next time without the technical breaks though! 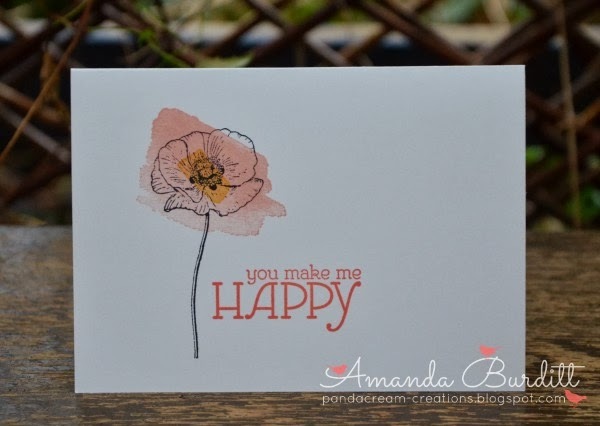 Anyway, onto today's Simple Sunday is such a super easy, clean and simple card! 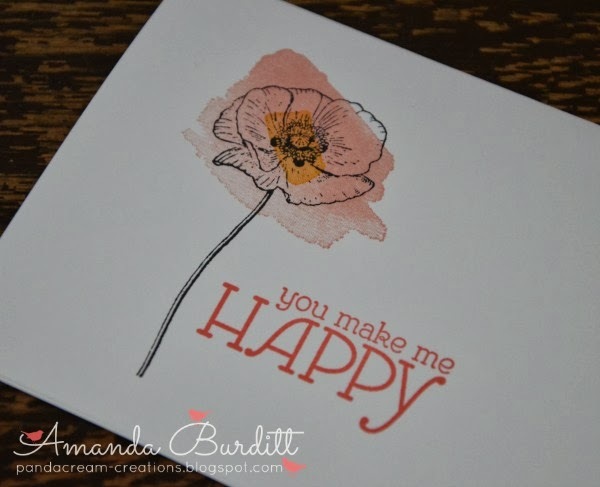 Its using the Happy Watercolor stamp set (see below). This set is March's card club set. If today has whet your appetite and you'd like to make 5 gorgeous card using this set for £8 (or get the club for free when you place a £25 order on the night) then contact me to book your seat! This is an easy one layer card - great for whipping up super quick when you need an emergency card or perfect for posting as its completely flat! This stamp set has these beautiful gradient stamps in it that look just like watercolour - this gives the look of watercolour with none of the hassle of watercolouring! Really liking this out of the lines effect on the flower here! Hope you enjoyed this clean and simple card. Come back tomorrow for another Inky Fingers Challenge! !